It’s Saturday afternoon in the Alps and a concatenation of events means I’m making Samosa. I’m stuck indoors – it’s been a cloudy, misty, snowy, drizzly few days in the Alps with few and far between fleeting glimpses of sun before the clouds come in and obscure and paint my view grim-grey. 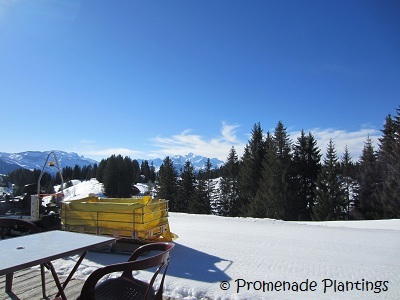 Added to which we’re in the final throes of Alpine living which means we are playing the “eat the contents of the fridge/store cupboard/freezer” game. Plus our landlords are coming round tonight for drinks and snackies. So Saturday Samosa is born. Or Fridge-Freezer Samosa if you prefer but that doesn’t have the same ring to it. Roger over at – Camerahols / Food, Photography & France seems to have all the sunshine at the moment, and his cheeky but funny comment about the “They’re devils how they hide, those Alps” made me think of sunnier days in Charente, visiting friends and making Samosa with the boys and taking them to an all day pique-nique. They were a hit by the way. (the samosas, everyone knew the boys beforehand). I also want to drop some off at the ski shop we use, the guys there are gems and have looked after us all season, their knowledge and helpfulness has made our trips out even more pleasurable, their good humour when frankly all around them is chaos is remarkable. Besides one of them cleaned our car today as they were washing down the skis prior to storage for the summer and he misses a good old British curry. Happy to oblige my friend! And then as I was making them I realised that the light is completely crap. No two ways about it. See I told you Roger has all the sun and blue skies this week. So no photo opportunities for show and tell today. So I looked through the photo archive at the samosa we made in Charente, but I can’t use those as they have the kids in and I don’t have permission to use them (answer your texts my friend!). So stop with the whingeing and on with the recipe. I make samosa regularly, a party food special, but I don’t follow a recipe so stick with me. It’s all cooked by eye, look and feel and then tasted to finish. The contents of our fridge – a cauliflower past it’s best, a couple of carrots that need using, a bag of soon to be soft potatoes, a few straggly green beans, a tomato that has seen better days and half a bag of frozen peas bought when I needed a cold compress for my bust shoulder. The ingredients don’t sound tempting written up like that do they? But by the time I’ve chopped and peeled and primped and cooked, they will be perfect samosa stuffing material. Of course you can use perfectly lovely fresh veggies if you prefer. In a large Wok or frying pan, heat the oil until it’s nice and hot and then add the mustard seeds, when they start to pop add the onion and fry gently until the onion is cooked, but not browned. Now spread the filo pastry onto a worktop, you need to work quickly here. If you are using rectangle shaped filo pastry you can cut your pastry sheets either into 2 lengthways for large samosa or 4 strips for smaller ones. If you are using the round sheets cut in half. Place a teaspoon or two of the mixture at one end of one strip of pastry, fold the pastry over them to form a rough triangle shape, and then keep folding up the pastry sheet until you reach the end. Seal the ends down with a bit of vegetable oil and place the samosa on a greased or lined baking tray. Repeat with the mixture until you have used all the pastry. Put them in the oven on a high heat and cook for about 20 to 30 minutes until the pastry is golden in colour. Remove from the oven and place them on a wire tray to cool. Now pack them up for your pique-nique or eat a few before your visitors come round with some pickles! If you have any mixture left over you can either freeze it for another days samosa fest or eat it will some flat bread and yoghurt. By the time I post this and you read it they can be Sunday Samosa if you like, or of course Friday Fridge Filo Freezer Night Samosa. Ok I’ll stop! Bon appetit mes amis, I’m off to finish cooking and then try and tidy the apartment and myself, which means shutting doors and slinging my jeans on instead of my yoga pants and thermals, who says we’re not dressy people? They sound really tasty I will make some of them I think, I suppose you can add meat if needed. I love samosas, thanks for the receipe. yum yum, wish I could drop it for a taste!! thanks for recipe. Will file it away for next time I’m in the mood for samosas. I love samosas. I’ve never made them with filo — I use a whole wheat wrapper dough. I’ll post them once pea season gets going because samosas are one of the things I can hide a few peas in and still eat them. Sounds delicious. Enjoy following your posts and travels and glad you had fun with FR. Everyone loved the Skiing post with her at the Pinnacle and with you, Claire. Have fun tonight. Hope the samosas go down well with Mr and Mrs T! The weather really hasn’t been very cooperative of late – cloudy and drizzly and snowy so you ar enot missing much of a view!! I thought you might/did ! you can play around with the fillings to your hearts content, and a great fix when you HAVE to have Indian snacks. And yes please to warmer weather, I’ve had to put my thermals back on this last week or so. Humph! I haven’t made my beef samosas in ages cause I don’t like deep frying, so when I DO, I make a double batch of appetizer sized ones ( 5 doz) and freeze the extras. Hi there, I remember the post, but now I can’t find it. Could you add a link? Oh and I always think homemade are the BEST! It’s hard to do all my own cooking I’d like to do AND try the new recipes that I run across when there’s only me at home to eat the results. At least with desserts, I can give them away at work. 🙂 One day SOON though I’ll make samosas again… (I hope). I love Samosa’s anf love your recipe here. I have never put so many vegetables in a samosa and now I really can’t wait to! He, he you know I don’t usually add quite as many veggies either, but it was a case of use it or lose it, mind you there is still soup to be made! Your samosas sound tasty, Claire, very flavorful. I do hope the clouds break, giving you a chance for a few parting shots. This is no time for the Sun to be shy! I’m going to have to remember this.. we’re always stuck at the end of the summer with odds and ends in our fridge at the lake. What’s worse, people who leave sooner bring by their left over food.. and we get stuck with that as well!! Sunday Morning Samosa here for me! Love them, and I am now asking msyelf “why have you never made these in Spain Tanya?” Answer, “because you just didn´t think of using filo pastry”. Brilliant, and a great use of those veggies! 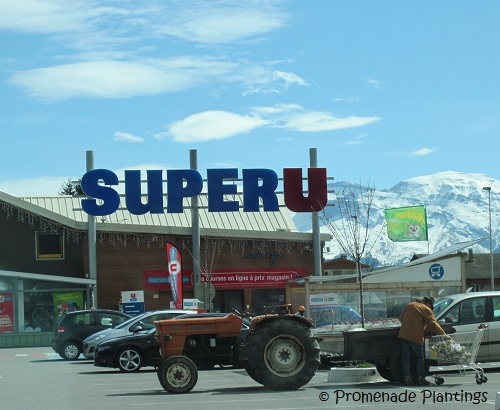 We used to do our weekly shopping at the Super U in Mauritius when we lived there. I hit that little “more” button to access “email this post” to forward your recipe to maggie. She is a huge fan of Indian/Thai/Arabic food and a wicked good cook, like you! I also commend you for not using photos of friends or relatives without getting permission first. I won’t even mention people by name in my blog without asking, and I always wondered if other bloggers did the same!